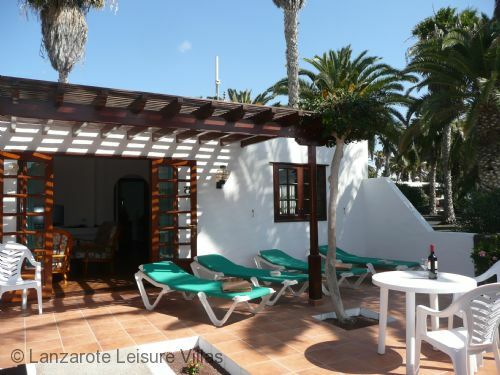 The very popular Las Brisas development of traditional Moorish style semi-detached bungalows with white walls and natural woodwork is just a 5 minute walk from the Playa Blanca main beach and all it's facilities. Las Brisas has at it's centre a superb 40m fresh-water swimming pool with extensive sun terracing with many sunbeds, some of which are shaded under palm trees, along with a separate heated children’s pool, reception, poolside restaurant/bar, small shop, children’s adventure playground, games equipment and flood-lit tennis courts. A lifeguard is on hand and a pool lift available to help disabled visitors. There is internet access from the bar/restaurant area. An excellent place for a snack, drink or an evening meal. You can enjoy evening entertainment for children and adults here. There are colourful tropical garden areas and walkways between the bungalows as you wander towards the very large swimming pool. Villa number 72 is located in a prime spot away from the pool in a quiet cul-de-sac of just two villas with no passing pedestrian traffic. 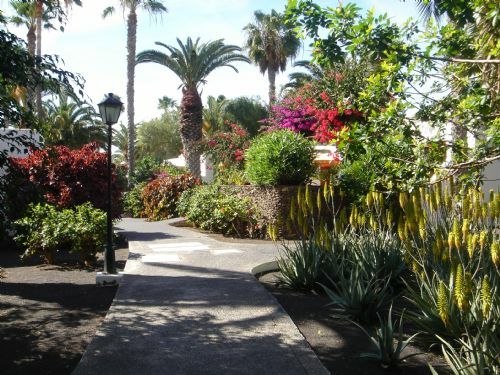 For easy access to the off-site supermarket and beaches of Playa Blanca, there is a secure pedestrianised gate due south of the villa along Calle Fuerteventura. The extended private patio and garden is fully enclosed offering somewhere quiet to relax. The garden is gated so it is a safe area for children to play. The open-plan design of the kitchen, dining room and lounge works really well for guests. The villa is all on one level with patio doors opening from the lounge to the terrace, which makes it seem a continuation of the villa. 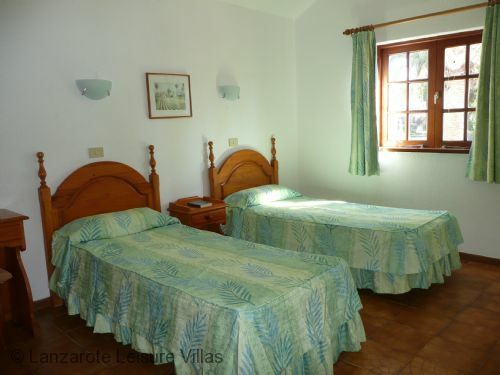 Air conditioning is available in the bedrooms, please ask at reception - 50 Euros per week. The Las Brisas complex facilities make it an ideal choice for families and the quiet location of the villa makes it perfect for couples looking for a relaxing holiday. 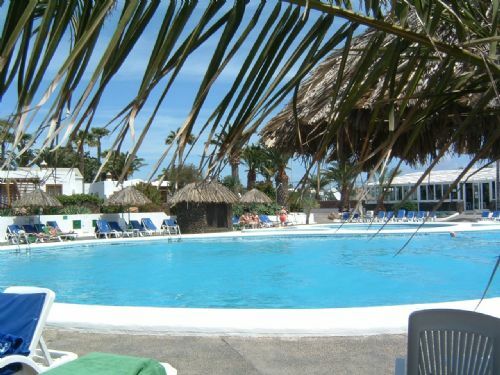 Just a 5 minute walk from the main Playa Blanca beach if you can drag yourself away from the pool or the garden. We have been renting out 72 Las Brisas on behalf of it's owner since 2004. 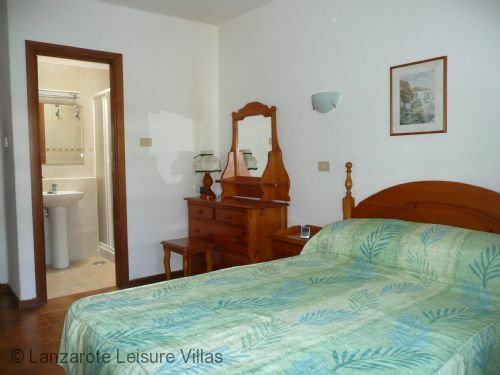 Hi just back from a weeks stay at the above villa in playa blanca, this villa is in a very good spot in the complex set among well maintained gardens being one of a pair of villas with no passing pedestrian traffic and is very quiet. The villa is quite spacious With two double bedrooms (one with en-suite shower) a spacious bathroom and a very good sized kitchen diner lounge containing everything you would need for a relaxing self catering holiday and a large terrace with patio furniture and loungers.las brisas itself is is in a prime position in the resort being only a few minutes walk from the centre and and is well managed with a good bar/restaurant area We would recommend a stay at this villa and will return to it if visiting the resort in the future . Just a quick email to say thanks for the Villa, we had a fab time in las Brisas as usual ... hope to be back next year. Just a bit of feedback in case you want to add a couple of things, large glasses would be useful as kids were always having to refill in night, and plastic mugs to take tea to the pool. Thanks again. 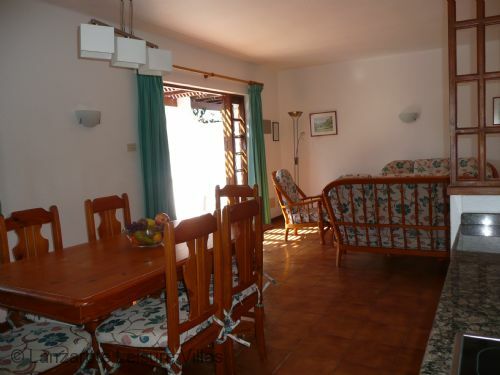 The best thing about this villa is that it is peaceful & fantastic location. Lovely South facing sun trap terrace, but with enough shade if you need it. Everything you needed was provided. I was very impressed that it even had a fizz keeper for a bottle of Cava. 5 minutes walk to excellent supermarket. A lovely 40 minute walk in each direction along the well lit, well paved walkway to Marina. Fantastic restaurants, every cuisine catered for. We did not need to use the Air con ( October ) but with windows open, plenty of ventilation. I would have no problem recommending this villa. Just back from another fantastic visit to Lanzarote have stayed at Las Brisas before a lovely complex well maintained, close to everything. First time in your villa and loved it, we will definitely book again. 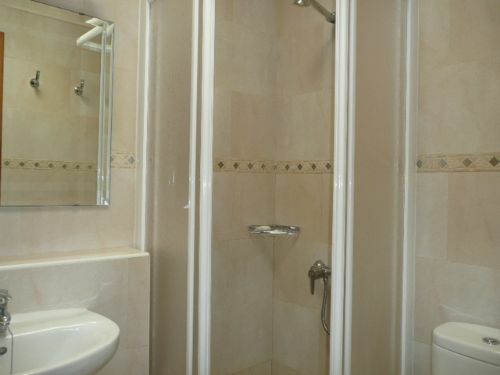 Very private, spacious and spotless no complaints at all. Look forward to another stay. 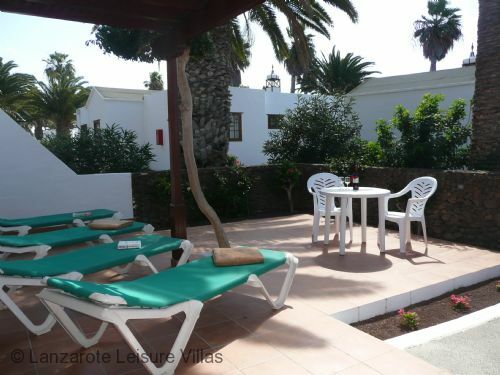 J and H.
This is the 5th time to lanzarote but the first self catering. The villa was lovely, the complex well maintained, friendly, nice food and drinks on site for reasonable costs. 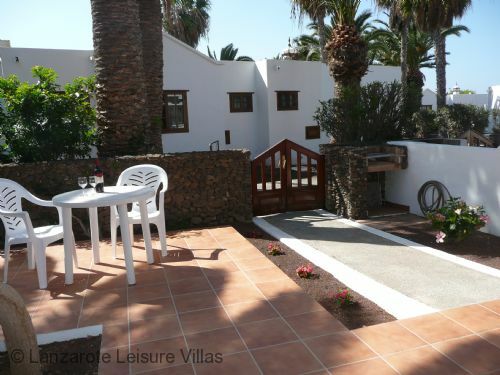 Close to playa Blanca beach and shops. Las brisas was gorgeous, thoroughly enjoyed our stay and definitely interested in next year. We had a lovely stay thank you, the villa was in a peaceful location within the complex but only a couple minutes walk from the lovely pool area. 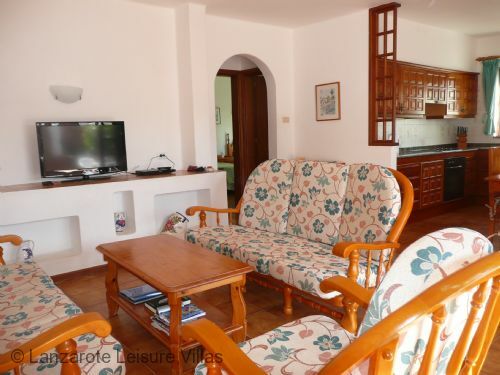 The villa was a great size with a spacious terrace with our own loungers. Location in relation to shops and restaurants great too. We would definitely return. Hi, we had a great holiday thanks. 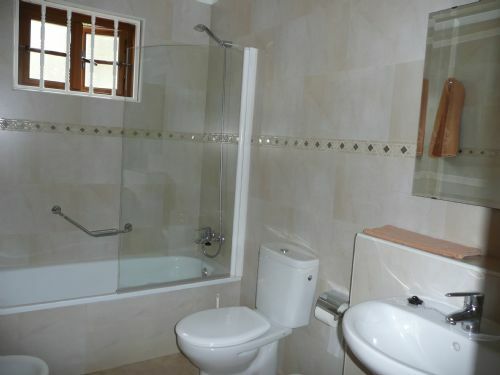 The villa was clean, well equipped and was perfect for our family holiday. The resort was lovely and in a good location. 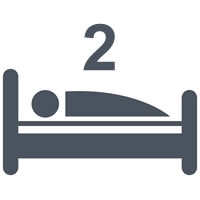 Everything went smoothly and we were very happy with all aspects of the booking and quality of accommodation. Thanks again, we would definitely not hesitate to book another villa with you. We had an excellent holiday and that Villa 72 more than met our expectations. It was clean, spacious and comfortable. The Las Brisas staff were all helpful and courteous to us. The check in was straightforward and quick, as was check out. Only regret was that we had to leave ! I'd use your company again without hesitation, and would recommend others to do so also. 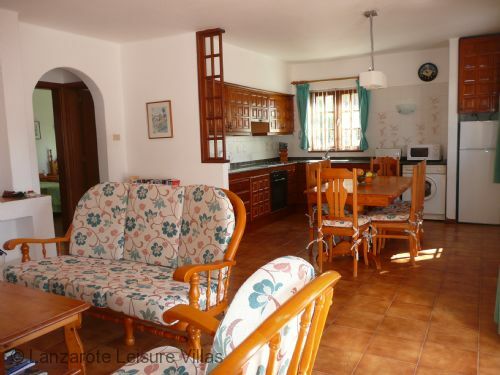 This is a lovely villa on a well maintained and run site. 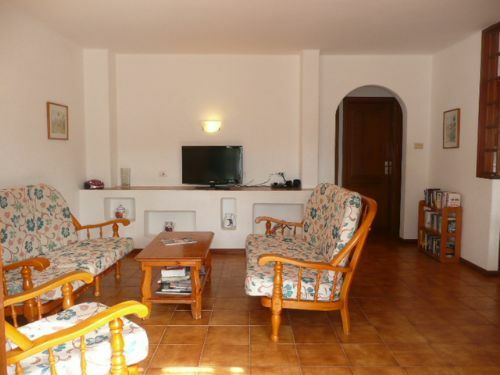 The villa has everything you need from a washing machine to cd player and a rack with lots of books for you to swap with ones you have read. The air conditioning made it easier to sleep at night. A Lovely heated pool that the children enjoyed and a club house offering entertainment including a quiz night which was great fun and a bbq with good food at great value. We look forward to returning! Playa Blanca is located in the southern part of Lanzarote. Known by the locals as the 'village', this area is home to the lovely white sandy beaches of Playa Blanca, Playa Flamingo, Playa Dorada and further east the most photographed of all the beaches in Lanzarote, the stunning, natural Playa del Papagayo. 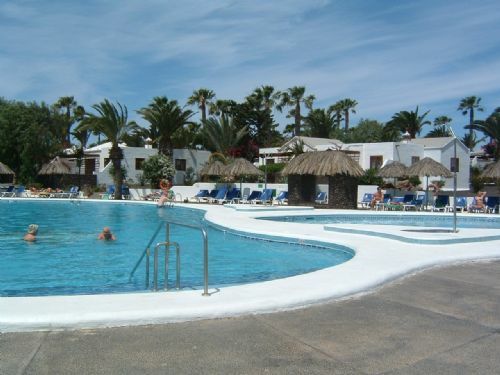 Las Brisas resort: reception, bar/restaurant, small supermarket, 40m fresh-water pool, children's pool, tennis courts, boules. Supermarket: 3 minute walk (250m) east to a large SuperDino. Local restaurants/bars: 4 minute walk (400m) east to the pedestrianised centre of Playa Blanca with many nice bars and restaurants along the promenade overlooking the beach. Shopping: 4 minute walk (400m) east to the pedestrianised shopping area and many more along the promenade adjacent to the beach. Beaches: 7 minute walk (600m) east to the main central beach of Playa Blanca overlooked by the many restaurants, bars and shops along the promenade. This pleasant, sheltered beach has golden sand, clear waters and provides fabulous views over northern Fuerteventura; an 18 minute walk or 3 minute drive (1.5km) south-west to Playa Flamingo, fine-grain golden sand in a sheltered man-made cove where the locals fish for octopus and barracuda. The waters are calm and shallow with a gentle shelf, scuba diving and snorkelling are enjoyed here or just stroll along the promenade with all the shops and restaurants; a 14 minute walk (1.1km) east to stunning Playa Dorado, which is 300m of fine, honey-coloured sand. A sheltered, calm, stretch of gorgeous beach perfect for toddlers, where you can also enjoy banana boat rides, pedalos and parascending; and finally, further east to Playa del Papagoya, the most photographed beach in Lanzarote, a 30-40 minute waterbus service from Playa Blanca marina (this includes a dinghy transfer at the beach) or a 2 hour walk (9km) or a 23 minute drive (10.2km). Harbour: 10 minute walk (850m) south to Playa Blanca marina, where you can catch the waterbus to the famous Playa del Papagoya or the ferry to Fuerteventura (ferry takes 25-35 mins) or 27 minute walk (2.2km) east to the new Marina Rubicon, with upmarket boutiques and you can pick up the waterbus to Playa del Papagoya. Lanzarote Golf: a public course just north of Puerto del Carmen - 31 minute drive (27km). Aqualava Water Park: a geothermally-heated water park 26 minutes walk (2.1km) or 4 minutes drive west. Buses are readily available for getting around Playa Blanca or going further afield. There is a regular service to Puerto del Carmen. 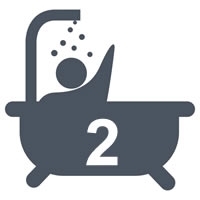 Both bedrooms have customer-controlled air conditioning available. This costs 50 euros per week and is paid for at Reception. Very large main pool. Life guard. Disabled pool lift. 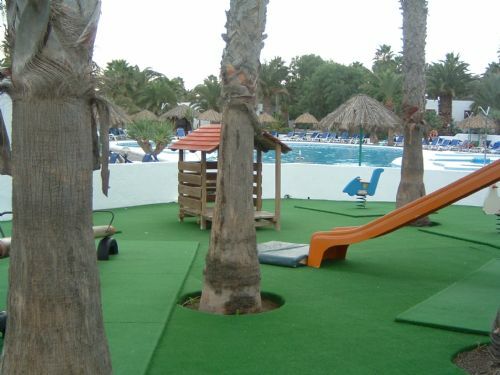 Pool towels supplied from Reception for a refundable deposit of 50 Euros per person. This is to prevent outsiders using the resort pool. A credit or debit card can be used for the deposit. WiFi is available free in the bar/restaurant near Reception. Complimentary Food Pack includes tea, coffee, sugar, eggs, bread, butter, water, milk, marmalade, biscuits and orange juice.